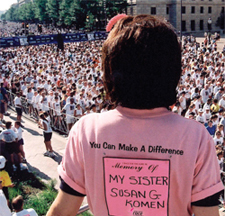 Susan G. Komen fought breast cancer with her heart, body and soul. Throughout her diagnosis, treatments, and endless days in the hospital, she spent her time thinking of ways to make life better for other women battling breast cancer instead of worrying about her own situation. That concern for others continued even as Susan neared the end of her fight. Moved by Susan’s compassion for others and committed to making a difference, Nancy G. Brinker promised her sister that she would do everything in her power to end breast cancer forever. That promise is now Susan G. Komen for the Cure®, the global leader of the breast cancer movement, having invested more than $2.2 billion since inception in 1982. As the world’s largest grassroots network of breast cancer survivors and activists, we’re working together to save lives, empower people, ensure quality care for all and energize science to find the cures.